History and architecture will collide in Madrid on this combo tour of the Royal Palace and Old City. This 5 hour private tour will explore Europe’s largest royal residence as well as the streets and attractions around it. It’s the ideal way to make the most of your time in the Spanish capital. Start at the Royal Palace, which features some 3,000 rooms that have been perfectly preserved. The palace is open to the public, since the royal family only uses it for official receptions. Marvel at the main staircase, designed by Sabatini and comprising over 70 steps. 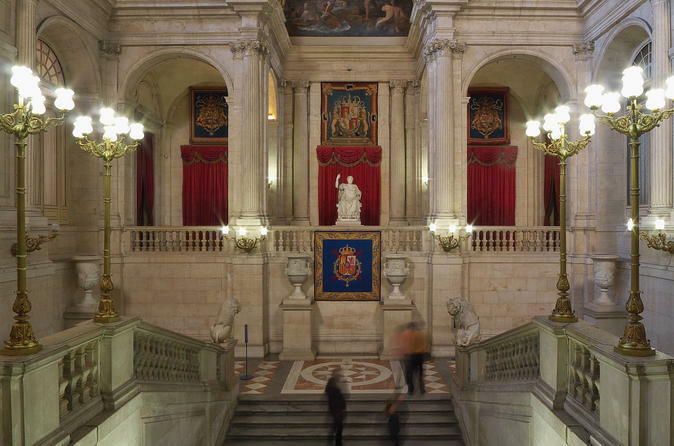 Visit the Throne Room and admire the ceiling painted by Tiepolo, and the Hall of Alabarderos, the palace guards. Your guide will also point out works of master artists along the way including Velázquez, Goya, and Caravaggio. In the Royal Pharmacy, you’ll explore cabinets with medicinal plants, ceramic pots, and formulas dispensed to the royal family. Visit the Royal Chapel and see its collection of stringed instruments made by the legendary Antonio Stradivari. Next, hit the streets and squares of the Spanish capital while visiting Madrid’s Old City. From the Puerta del Sol, Madrid's main square, you’ll follow your expert guide through the medieval streets to sites including Plaza Mayor, Santa Cruz Palace, and the soaring Almudena Cathedral. You’ll discover the curious Bakery House and the tapas-filled stalls at San Miguel Market. This charming district is popularly known as Habsburg Madrid, in reference to the ruling powers of the 16th and 17th centuries. It is here, in central Madrid, that you’ll even visit the world’s oldest restaurant to find out what the specialty dish is. Visit Madrid as it existed later under the Bourbon dynasty. You’ll wander the gardens of Plaza de Oriente designed by French emperor Napoleon´s brother. Learn about the Royal Theater and let the beauty of the French-inspired architecture wash over you as you discuss Madrid in the 19th century. By the end, you’ll understand the layout of the city and how its landmarks played a part in its rich history.